When our children are at school, we assume and hope that they are in a safe environment. However, we know that violence in schools has become a serious problem. The best way to prevent this type of violence is to empower students who are usually the first to hear about impending violence at school. While the best way to prevent violence is to inform a trusted adult, students can report threats of violence anonymously to the statewide, toll-free School Violence Tipline. Promoting the tipline is a collaborative effort of the Office of the Attorney General, the Illinois State Police, and the Illinois Parent Teacher Association. The tipline is answered by members of the Illinois State Police. Additional support is provided by the Springfield Mental Health Center. 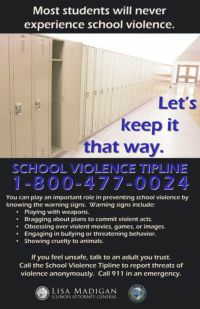 If you think someone is planning a violent attack at your school, please call the School Violence Tipline at 1-800-477-0024.